Sharing photos is a ubiquitous part of sharing experiences and here at M8 HQ, we’re dying to hear about your favourite places in the world...and see the photos! Send them to us and you could be in with a chance of winning some pretty cool prizes! Due to the fact that we like to have a project to keep us occupied over the summer - in between planning road trips, weekends away, holidays, festivals and of course...chasing the sun - we thought there is no better way to pass the time AND get to know our M8 community a bit more, than hosting a photo contest with you all! We want you to send us photos of your favourite places, that’s it! Everyone has that special somewhere that we hold close to our hearts. Whether it’s a place that sparks a specific happy memory, an area that we associate with travel, holidays and fun times, or even a location at which we feel at home, there are places and spaces that mean a lot to each of us and we want you to send us photos of that favourite place. And it wouldn’t be a contest without prizes now would it?! 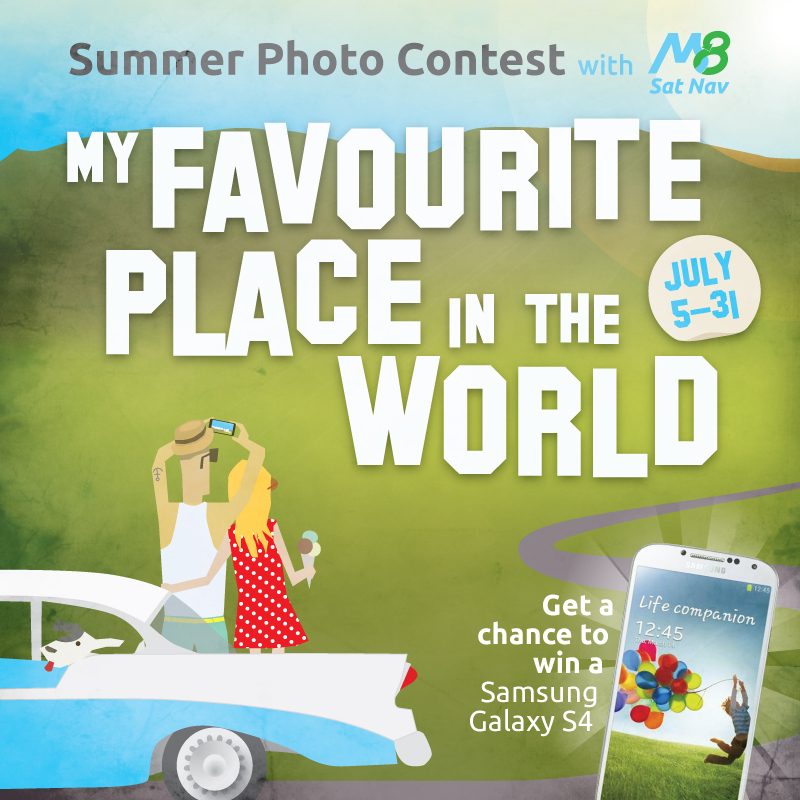 Never fear, we’re offering you guys the chance to win prizes that include a Samsung Galaxy S4, an amazing digital camera and a cool video camera - everything you need to stay connected, capture memories and share experiences! Hosted on our M8 UK’s Facebook page, all you need to do is ‘like’ the special tab, and enter! All photos entered into the contest will be opened up for voting by fellow Facebook fans. The twenty most popular photos - those with the most votes - will then be sent through to the next round during which a panel of highly esteemed judges - aka the M8 UK team, their mums and nans - will select the winners of the impressive prize packages. The competition will run until July 31, 2013, and we will be judging the 20 most popular photos after that to decide on the winning entries. We know you’re a creative bunch so we’re really excited about the photo contest to see if we can uncover some undiscovered talent too. We’ll be following the contest, and chatting about our favourite places on Twitter @localm8, and of course on our Facebook page. Remember to include #M8faveplace so we don’t miss your mention! Good luck folks, and get snapping!